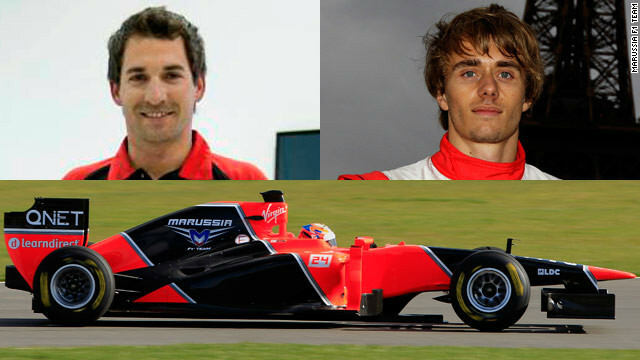 (CNN) -- The rebranded Marussia team were plagued with difficulties in the buildup to the 2012 season, with the MR01 failing the 18th and final official crash test. The car did eventually pass the test in early March, but the delay meant the Britain-based marque entered the new campaign having not tested it at any of the three official preseason events. The team competed in the last two seasons as Virgin, finishing bottom of the pile and pointless in both campaigns before being bought out by a Russian car manufacturer. Its drivers have never finished higher than 14th in a race, with Brazil's Lucas di Grassi and Belgian Jerome d'Ambrosio lasting only one season each. The German scored two points for Jordan on his F1 debut at the 2004 Canadian Grand Prix, but failed to register in two years with Virgin. Glock went three seasons without a drive following his initial breakthrough, before being handed a seat with the now defunct Toyota in 2008 and 2009. The 29-year-old's time with Virgin has been blighted by retirements, with Glock forced to with draw from 12 of the 36 grands prix he has started. Glock finished last season 25th out of 28 in the drivers' standings. He was lowest ranked of the drivers who had cars for the entire season. The Frenchman made his debut behind the wheel of an F1 car at the young drivers test event in November 2011, and will pick up valuable racing experience during his rookie season with minnows Marussia. The 22-year-old is being mentored by compatriot Olivier Panis, a former Toyota and Honda driver who started 157 grands prix during 11 years in the sport. Pic finished third in the 2009 Formula Renault 3.5 season and has also competed in the GP2 Series, a feeder for F1.